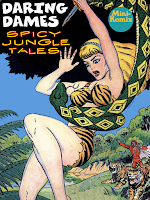 Daring Dames spins some Spicy Jungle Tales! Featuring curvy congo queens like Camilla, Nurla, Tiger Girl, Luana, Betty Burd, Princess Talya, Dolores, Tonda, and The Sun Mistress, plus the British air ace Diana Hastings in a sultry safari! Amazing amazon adventure from the Golden Age! You can download this now at Lulu and Drive Thru Comics plus as part of the Daring Dames: Jungle Girls Collection Bundle.